On Wednesday, 26 November 2014, the Architecture Foundation and Feilden Clegg Bradley Studios hosted a debate on architectural education in their central London offices. Chaired by Robert Mull of the Cass at London Metropolitan University, the panel consisted of Peter Clegg of FCB, Gemma Barton, editor Edge Condition and Senior Lecturer of Interior Architecture at Brighton, and Neil Spiller of Greenwich. A week on from the event, and having since then attended part of the Architecture Students’ Network (ASN) 2014 conference at Kent University on behalf of the aae, here are some of my own thoughts about the debate. Feel free to disagree, comment or complain. Phil Pawlett Jackson of Building Design was also in attendance, and his report is here. These thoughts on the debate have been drawn up from a few pages of notes which tried to capture much (and which probably missed even more) of the evening. Thanks to Raymond Quek at the Leicester School of Architecture who facilitated my attendance. This account and the opinions expressed therein are my own, and are not necessarily representative of the LSA or any other organisation I am associated with. I was joined in the audience by Harriet Harriss, who with Daisy Froud has edited a new book called Radical Pedagogies which was plugged a few times during the evening. In one of that books chapters, I write describe architectural education as a kind of inverted duck: one that is paddling furiously above the water line but proceeding calmly in the same direction below it. This debate did not change my opinion about our discipline’s need for debate and argument, nor its tendency to generally carry on in the same old fashion until forced to change direction. Mull urged us to disregard the usual debates about the duration and structure of architectural education, describing them as a big distraction and which will be determined by the implementation of the European Union’s 2014 Professional Qualifications Directive (PQD). Mull was more concerned with the entanglement of architectural education to higher education, it’s and interlinked agendas of privatisation, fees and its ever narrowing social accessibility. Despite briefly forgetting his own caveat (by asking whether Part I should be a generalist degree and Part II a specialist, or vice versa), Mull turned the debate over the panel with a prompt: is there an underlying value that unites all architectural education? Peter Clegg set out six points. Firstly, he believes that architectural education is alive and well, and across the country has a wide philosophical approach. It has captured more of academia than he experienced in his own education. Secondly, the architectural profession has changed beyond recognition in the course of Clegg’s lifetime, and he does not believe that education has not kept up. Looking ahead, if the duration of formal study shortens, then architectural practice needs to be more involved. The profession is currently failing those students who spend their early years of practice locked into monotonous CAD work. Thirdly, the public perception of architecture has also changed. Whereas in the nineteen sixties and seventies production was focused on quantity, now there is a focus on speed, sculpture, and superficiality. Fourth, architects hold an expanded brief, considering both wider urban design and a truly global context. Regeneration will become a more important element of our work, simply because of the wastefulness of losing the embodied energy of existing buildings. Fifth, Clegg believes passionately that we must integrate making in architecture, and tries to continue to have a hand in making in his own practice. Finally, Clegg reminded us that we are complicit in the problems of global warming, and that sustainability is not a fad that is going away. Gemma Barton spoke next, starting by observing that if we need to overhaul architectural education, it’s not because it’s anyone’s fault. The world has changed and we need to catch up. Barton explained how, in spite of our fascination with radicality, it tends to go one of two ways: either having a large impact in a small location and then fizzling out, or becomes a big success, becomes the norm, then loses its radicality. Regarding the delivery of architectural education, Barton identified two principal routes into architectural teaching. You either do a little as a teaching assistant, and someone gives you a break with a unit master, or you go down the path of research, usually via a PHD. Barton believes we need a new route for people who don’t fit those two categories, a kind of tutor school. Acknowledging that a change is required, Barton finished by saying that there not going to be one solution, but we won’t be able to decide on the route until we agree want we want from architectural education. As Barton finished, Mull posed a question to Neil Spiller: can you teach radicalism? Spiller argued that yes you can, and that architectural education is well suited to teaching students to “think outside the box.” Mull was aware that a number of a Barton’s former students were in the audience, and asked them “can you tell us how she teaches?” This was, frankly, an odd question, given that none of the other panellists were thus interrogated via their former students. Mull asked Barton from what sort of platform can one become radical? She suggested that one requires a certain amount of intelligence. One needs to teach you how to think, not what to think. Barton is not in favour of the architectural maestro model in which the students are given the diving board off which to leap. A question came from the floor defending “the textbook” approach to architectural learning, i.e. providing students with a solid body of architectural knowledge from which to learn and then argue with. In the questioners words, “the textbooks are where you put the knowledge.” Students seem to be arriving into the learning environment without knowing that the architectural education system is being overthrown (again). In short, Spiller made an impassioned defence of the orthodoxy, arguing that before we consider and debate what architectural education doesn’t do we should celebrate what it does do. Technology, materials and digital fabrication are all changing, and that change is being led by innovative architectural education and research through teaching. In Spiller’s words, “the best architecture schools are agile, but universities are not.” It is vital that we recognise and value the research and models of teaching in the independent and diverse (and presumably unit-ised) studio. Dismissing the passing fad of parametricism, Spiller observed that schools of architecture blossom and then stagnate, although these may have been cross-town jibes that were lost on me, a inhabitant of the uncharted territories beyond the M25. Spiller witnesses and recognises a wide diversity of media, techniques and agenda in student work today, and celebrates the absence of an over riding global dogma as influential as modernism once was. In Spiller’s eyes, architectural education is far from dead. The debate over ran slightly, so questions from the floor were limited. Toby Carr, of Sarah Wigglesworth Architects and part time lecturer at Greenwich posed a further question about radicalism, noting that it is very hard to assess: is one reviewing the product or the process? Has there been a learning process or is this just the pretty graphical exercise of the unit tutor? Another question (I believe from Fiona McDonald – apologies, as I couldn’t catch or confirm her name) observed that despite the very best efforts of architectural education, the profession is becoming less and less diverse. Saddened that no non-architects or prospective students were in the audience, she asked what can be done? Spiller responded, simply observing that the populations of schools of architecture are currently very diverse, and that diversity will inevitably filter through to the profession. Vinesh Pomal, architect, responded from the floor, noting that the Architecture Students Network (ASN) was holding it’s annual conference at Kent University the following weekend, but that only thirty students had registered, and that letters addressed to heads of schools invited the network to be promoted had largely gone unanswered. The evening ended with panelists being asked for five verbs about the future, which they mostly and probably wisely ignored. This month sees a book review double header courtesy of RIBA Publishing, who have just launched two new titles targeted at graduates and early career architects. 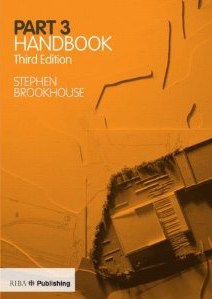 First up, the third edition of Stephen Brookhouse’s Part 3 Handbook, and secondly Adrian Dobson’s 21 Things You Won’t Learn in Architecture School. The Part 3 Handbook will be familiar to many graduates of the third and final stage of the Royal Institute of British Architects’ (RIBA) professional examination. The third edition of the handbook comes in fairly short order after the first (2007) and second (2011) editions, and as the only title either published or endorsed by the RIBA, is the de facto textbook for the qualification, regardless of the institution candidates choose to study with. As such, it’s not the sexiest or most ground booking title I’ve had the pleasure to review, but a quick comparison with the preceding editions reveals the extent of the revisions and improvements to both the content and presentation of the material. For many candidates, especially those who struggled to put together a coherent body of work during the Great Recession, the case study of the Part 3 examination remains the most unnerving element. The book goes to some length to re-assure students of the breadth of possibilities that can be developed into workable examples. These include potentially complex international projects, in which architects will find themselves working with design contracts, management contracts, planning processes and health and safety legislation from multiple jurisdictions. As more and more candidates sit the Part 3 exam internationally, including in Asia and the Gulf, the question will inevitably be whether the curriculum and examination process can reflect not only the increasingly globalised nature of architectural practice, but the specific requirements of candidates in these countries. No longer is it sufficient to draft a letter to a planning officer in a fictional Home Counties market town. Brookhouse is an experienced architect and teacher, and the step-by-step annotations of example essay questions and answers are clear evidence of his appreciation of students’ requirements. Sections on every aspect of the examination (written, interview and case study) have been revised and expanded, including sample questions and detailed analysis of how to read the questions accurately. Revisions have also been made to bring the book up to date with the 2013 RIBA Plan of Work. Having also written Professional Studies in Architecture: A Primer (978-1-85946-347-5; targeted at students on RIBA Part 1 and Part 2 validated courses) Brookhouse is well aware of the requirement for taught students to be introduced to the professional aspects of architectural practice at the earliest possible moment. While the Part 3 Handbook is unlikely to initially appeal to university students of architecture, its accessibility makes a vital handbook not only for graduates starting their post-Part-2 careers, but also those students with the foresight to proactively choose or design their early career path with RIBA Part 3 qualification in mind. In other words, don’t wait until you enrol on that Part 3 course to start reading this helpful guide. Similarly, the blurb for Adrian Dobson’s new book 21 Things You Won’t Learn in Architecture School describes it as an “invaluable source of advice for architecture students, particularly those at Part 3, but also those who are newly qualified and in their first few years of practice.” I beg to differ, as I reckon 21 Things and the Part 3 Handbook are sturdy bookends for both beginning and the end of a formal architectural education. 21 Things is arranged in two parts: firstly, the 21 ‘things’ of the title and secondly the edited transcripts of twelve interviews with the twelve architects who contributed to Dobson’s research. I’m greatly encouraged to read these interviews, as (notwithstanding a few questions about how the sample was chosen, or the transcripts edited) its sound qualitative research that captures the kind of deep, meaningful and diverse practice-based knowledge that I know undergraduate students of architecture crave. My favourite book about architectural education, The Favored Circle by Garry Stevens (978-0-26269-278-6), reminds us that the function of architectural education is not the process of learning how to ‘do architecture,’ but the process of learning to ‘be an architect.’ The lessons from practice in 21 Things touch on a variety of themes that speak to both how one does architecture and how one is an architect. These lessons cluster around some of the the mythologies of architecture (for example: ‘in architecture, it’s a long road to success’ and ‘architects think differently’), the people skills that architects need to do business (for example ‘speak in a language your audience understands’ and ‘focus on people and process, not product’), and perhaps most importantly, the importance of money (for example: ‘architecture is a business’ and ‘you need to understand fees’). As a companion piece to Matthew Frederick’s popular and successful 101 Things I Learned in Architecture School (978-0-26206-266-4), 21 Things is a far more grounded and diverse compendium of insight. That is to say, many of the insights in Dobson’s book relate to meaningful questions of professional practice, as opposed to some of Frederick’s glib and occasionally antagonistic observations (for example, “an architect knows something about everything / an engineer knows everything about one thing.”) The reflections on practice from some highly respected and established architects have clearly been learnt with no small amount of error along the way. Even if these reflections don’t immediately inform an early career architect’s practice, they will at least provide reassurance that learning both how to ‘do architecture’ and ‘be an architect’ is, as the first ‘thing’ tells us, a lifelong project. While schools of architecture up and down the country work to build their own curricula that interpret and demonstrate the Graduate Criteria of the RIBA/ARB Validation process, the twenty-one ‘things’ of Dobson’s book are a helpful reminder to both educators and the profession that some core employability skills continue to be overlooked by both universities and the profession. Perhaps, taken together, Brookhouse and Dobson’s two new books are a timely reminder of our profession’s widespread educational delusion with teaching design in isolation from clients and construction industry collaborators. The publisher provided the author with complimentary review copies of this title.